Trump&apos;s Tariffs Are Screwing Farmers. Many Still Won&apos;t Blame Him. SHERRARD, Illinois ― Krista Swanson is a fifth-generation farmer. So is her husband. They have three young daughters who they hope that, one day, will be the family's sixth generation of corn and soybean growers. "You actually lose every day," said Swanson, a member of the Knox County Farm Bureau. "You're still paying to go to work and back, and make and buy lunch, but you're losing money. Who would want to keep doing that, you know?" For some context on the severity of the situation, Swanson said in March the average central Illinois grain farmer expected a net income of about $35,000 this year. Those farms are now "substantially" in the negative, she said. Yet, asked if she's angry at Trump for starting a trade war and potentially driving her family farm into the ground, Swanson wouldn't blame him for anything. She compared it to farmers dealing with challenges like droughts or pests. "We're just hoping this doesn't last a long time," she said, "and that we can get to a point where we end up in a better place." HuffPost talked to eight grain farmers in the region, which overwhelmingly voted for Trump in 2016, and we asked them how his tariffs have affected their business. Nearly all had the same response: They fear economic ruin if Trump doesn't resolve the situation soon, but they won't criticize him for causing an international rift that threatens their livelihoods. Mike Zecher, president of the Mercer County Farm Bureau, said he had been hoping to replace his main tractor for planting season because it's almost eight years old. But because of the uncertainty of tariffs, any decisions on replacing equipment have to wait. "You've got to be an optimist. Because if we weren't optimistic, we'd go crazy," Zecher said with a weak laugh. "If we got upset, think about every month when we don't get rainfall." "Yeah," said Zecher, trailing off. "To a certain degree." 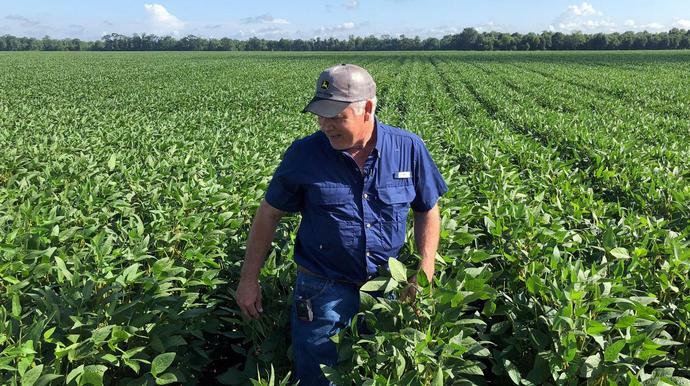 Jeff Kirwan, a soybean farmer, said he's worried that as Trump spars with China, other countries like Brazil are going to sweep in and eat into the U.S. share of the global soybean market. U.S. farmers have spent decades developing this market. "Every day that we're not in the marketplace, there are adjustments being made all over the world," said Kirwan, who is a member of the Illinois Farm Bureau board of directors. "In South America, they're going to pick up that slack." Asked if he's frustrated with Trump's aggressive use of tariffs, he said only that the president needs to resolve the situation quickly. "We're trusting our leaders to lead us in that direction," said Kirwan. Republican leaders in Congress have done nothing to rein in Trump's actions on trade, beyond complaining and holding a symbolic vote in the Senate about tariffs. Under pressure to protect farmers, the administration announced last month that it would offer $12 billion in aid as the trade spats play out. But nobody knows how or when that money will be distributed, and farmers want a long-term solution. Swanson said by her calculation, the $12 billion "band-aid" translates to less than $6,000 per farmer if it gets divided evenly. "So if I'm negative $20,000, the $6,000 helps," she said, "but it's not fixing the issue at hand." It was, at times, mind-boggling to hear farmers describe the kind of financial hit they're bracing for ― and then skip over that this was caused by Trump. Seventy-five percent of farmers voted for him in 2016, so some simply may not want to go on record criticizing a president they and their community supported. But the fact that several farmers showed HuffPost data that they say ties the price drops to Trump's tariffs reflects that their dissatisfaction with him is real, if subtle. "The numbers don't lie. President Trump's tariffs are putting the livelihood of thousands of hardworking farmers across the heartland at risk," said Rep. Cheri Bustos (D-Ill.), who represents the district where these farmers live. "During his campaign, President Trump promised he'd 'end this war on the American farmer,'" she said. "I just wish he'd actually do it because right now all we're seeing is a trade war that gets worse from one tweet to the next." Brian Duncan, vice president of the Illinois Farm Bureau, speculated that farmers are willing to give Trump some time to fix the situation because he's done things that have helped them, like tax reform and loosening regulations. Patience may be wearing thin, though. "He put some change in his pocket with farmers. Now he's pulling that change back out pretty hard on tariffs," Duncan said. "There's a sense of growing frustration. It's becoming more and more evident each day that this is not going to be rapidly resolved." That does not reflect reality. America's trade deficit jumped 7 percent in June, based on the most recent data. And Duncan said the annual estimated net farm income, which is typically about $60 billion, is estimated to drop by $20 billion because of Trump's tariffs. "Oh we're losing money already," he said. "As soon as harvest comes ― it's going to start in a month ― this becomes real. This becomes real." It's already real for Jerry Link, the one farmer who said he's had it with Trump. "You've heard the last few days that our exports are really record high. No!" said Link, who has been farming soybeans and corn since 1960. "The reason we've lost $2 a bushel on beans is because our exports aren't good." Link, who lives in Abingdon and was a GOP local elected official for years, said he goes to coffee every morning with "some pretty strong Republican farmers" and tries to talk about Trump's tariffs being bad for agriculture. "When we make every country upset, it will be hard for us to get our exports and trading partners back," said Link, whose wife Maryanne stood nearby nodding. "I am very upset with our Republican president. Very upset." "He has no concept of what it's like out here in the real world."